This week for French Fridays with Dorie, we made Marie-Helene's Apple Cake. This cake contains more apples than anything else and I decided it would be perfect as one of the desserts I made for a Fall get-together last week. I was making everything in cupcake form- pumpkin cheesecakes, pumpkin cupcakes, apple cheesecake (by Dorie too- what a great recipe! )- so I decided to turn this cake into cupcakes too. Dorie suggests using 4 different kinds of apples, so I used Granny Smith, Jazz, McIntosh, and Golden Delicious. 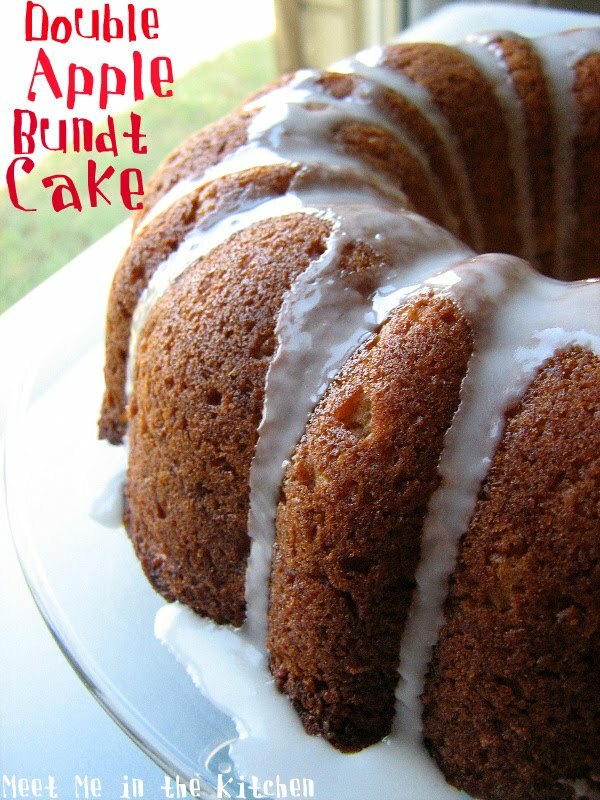 I substituted apple cider for the rum in the cake. My cupcakes baked up in about 30 minutes or so and turned out great. I dusted them with powdered sugar before serving and they were well liked. Go see who else made this cake and what they thought about it over at French Fridays with Dorie! You can find the recipe in Dorie's new book- Around my French Table and Here from epicurious. Sometimes the simpliest dishes are the most delicious and flavorful. That was certainly the case with this Ratatouille. We are still experiencing warm weather, so I had some zucchini, yellow squash, eggplant and bell peppers, that needed to be used. I didn't really feel like making soup or simply roasting my veggies (which would usually be my first choice), but I found a recipe for Ratatouille and it looked delicious. I saw the idea to bake it with eggs in a recent issue of Everyday Food magazine and used that part of their idea, but a simplier basic Rataouille recipe than the one they included in the magazine. To make this, all you have to do is chop your veggies, saute an onion, and then gradually add the veggies and stir. So simple. I decided to serve this over quinoa, but it would be great with pasta or as a stew. It really is so versatile. My son was not excited when he saw this on the stove, simmering away. He actually wrote me a little note that said "Really Mom, Eggplant? ", and left it by the stove, but he ate it and decided it wasn't that bad. He even said it was good. So, that was enough for me. Victory! I also wanted to share a cake I made this past weekend for my daughter's birthday. Not a great picture, but you get the idea. 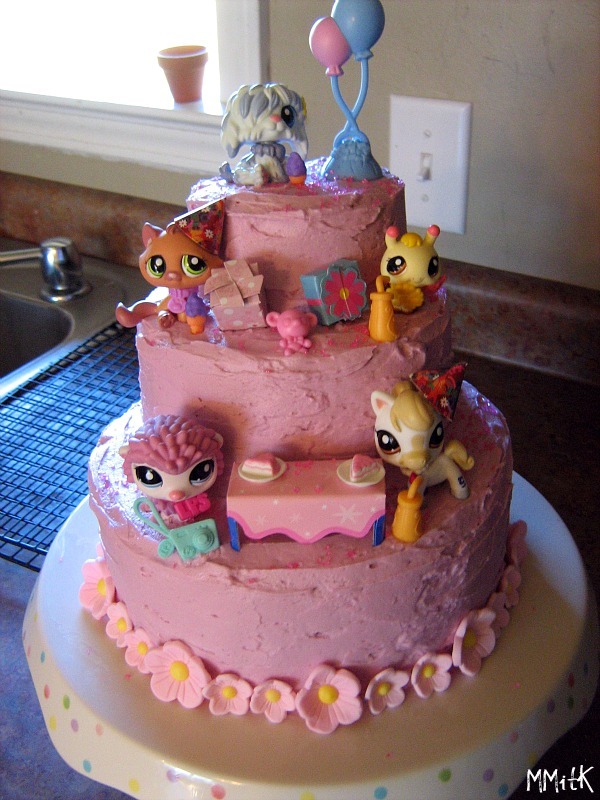 She was very specific in her request- 3 layers of alternating sizes, pink cake (inside), purple frosting and real Littliest Pet Shop toys for decoration. I used this recipe for Vanilla Buttercream and it turned out really well. She loved it. Crack 1 large egg into each indentation. Season eggs with salt and pepper. Bake until egg whites are set, 20 to 25 minutes. I guess I am just a muffin kind of girl. They are fast. They are easy. They can be healthy. They kind of feel like a treat, but healthy at the same time- kind of. I think muffins make a good snack. These particular muffins aren't very sweet, but they still have great flavor. The streusel that I added gives them just the perfect touch of sugar-y crunch on top. Because the apple is shredded, it is not as noticeable, which was a good thing for some people in my family. 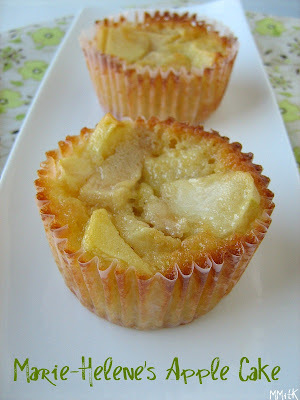 When I said I made apple muffins, my son was a little hesitant because he doesn't love muffins with chunks of fruit. Once he saw that the apple was shredded, he was in. Blend wet ingredients with a fork in another bowl. Stir in shredded apple to wet ingredients. Add wet ingredients to dry and stir just until moist. Combine streusel ingredients in a small bowl, combining with fingers until it comes together. Bake for 23-25 minutes until muffins begin to brown and a toothpick stuck in the center comes out clean. I had a little bit of pumpkin in the fridge, leftover from some sort of baking adventure and decided it would be fun to make a shake out of it. I remembered seeing a Pumpkin Pie Shake in Cooking Light many years ago, so I looked it up and decided to go for it. 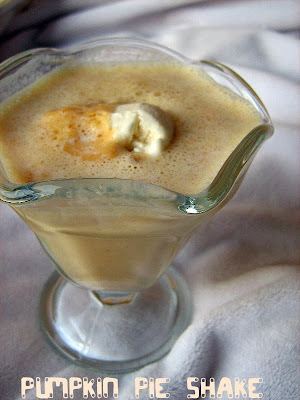 I used a combination of vanilla frozen yogurt and vanilla ice cream in this shake. I didn't have pumpkin pie spice, so I just sprinkled in some cinnamon, ground ginger, nutmeg, allspice and cloves. 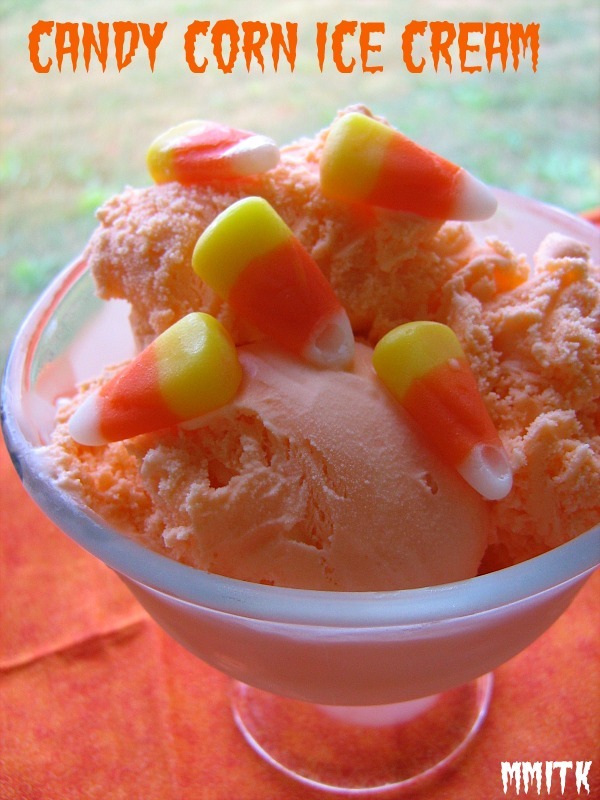 I don't ever use Cool Whip, so once I poured this into glasses, I just added a tiny scoop of ice cream to top it off. This was really good! It had great flavor and was so simple to throw together. I love that it really did taste nice and pumpkin-y. My family loved this shake. 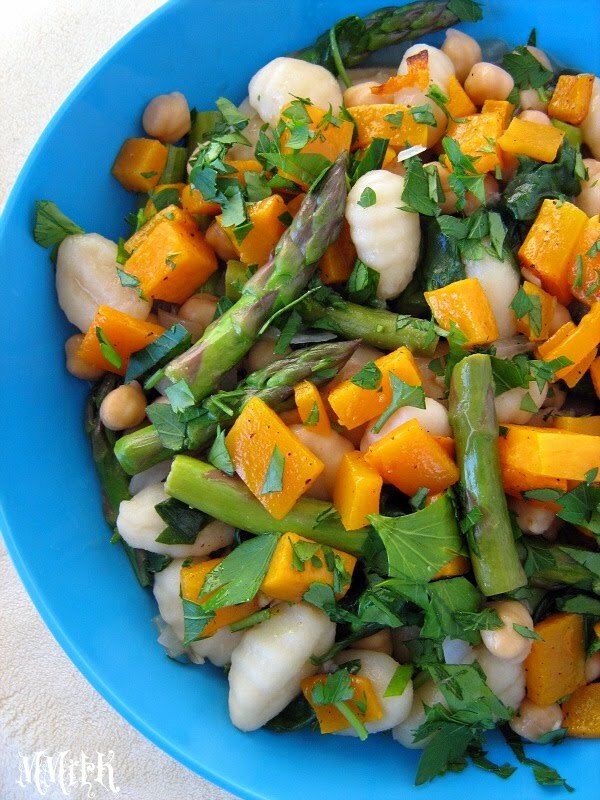 I was looking at a recipe on Eating Well and I saw a picture of this recipe- Chickpea, Spinach and Squash Gnocchi. It looked really good, so I decided to give it a shot. I've only made gnocchi once before and that was with sweet potatoes. I didn't feel like making the gnocchi from scratch this time, even though last time I felt it was fairly simple. Slightly time consuming, but not too difficult. I kinda just did my own thing as far as making it goes. I feel so comfortable in the kitchen that sometimes I see the ingredients and read the recipe and don't feel like doing what the recipe says exactly. I prefer to roast my butternut squash in the oven and so I decided to get that part of the recipe ready first. I cubed my squash into small pieces, drizzled it with olive oil and a little salt and pepper and put it in the 425 F degree oven. It was ready in 25 minutes. While the squash was in the oven, I prepared the others parts of this dish. I used an onion instead of shallots because I didn't have shallots. I sauteed my onion, added garlic, then the gnocchi and vegetable broth. I also added asparagus spears. I wilted my spinach and then stirred in the balsamic vinegar. Right before serving, I added the butternut squash. My kids enjoyed it and all those veggies in there added great color. I sprinkled some chopped Italian parsley on top, just for fun. This recipe was on the cover on the most recent issue of Cooking Light. 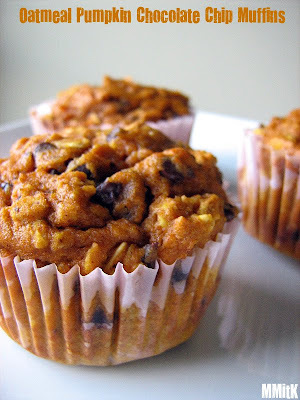 Quick breads and muffins are always an easy option when you want to bake something and I wanted to take a treat to my friend, so this recipe seemed perfect. I had some ripe bananas and I had seen Lori's in-depth review of the bread on her blog, Culinary Covers, so this went onto the calendar as a "definite make". I made the full recipe but decided to do mini-loaves and muffins, since those are so much easier to share. Plus, I wanted us to be able to try this recipe as well. From the full recipe, I got 8 mini-loaves and 9 muffins. I left the chopped peanuts out of the batter, but sprinkled them on top of some of the loaves and muffins. This bread was fabulous. 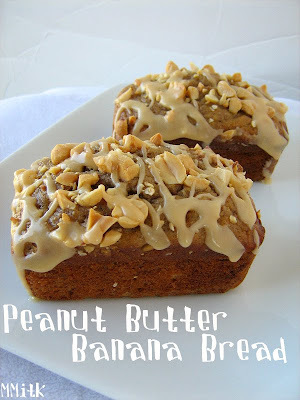 I have made almost all of Cooking Light's varieties of banana bread and this was another great one. I didn't think that the peanut butter flavor was extremely noticeable in the bread, but the glaze and chopped nuts on top, really made it seem peanut butter-y. I would definitely make this again. The person who I shared it with really loved it too. * I used skim milk in the icing and added more milk to make it the right consistency. I also added a little bit more powdered sugar. The other night when I made this delicious Vietnamese Soup, I decided that I wanted to make it a soup and salad night. I googled vietnamese salad and chose from the different links that came up. I have never looked at Goop before, but this salad sounded perfect because it included lots of the same flavors as the soup. I had purchased a bunch of baby bok choy at the farmers market the weekend before I made this salad. The combination of the bok choy and napa cabbage made for a really great texture in this salad. The flavors were unbelieveably delicious. So tasty. My whole family loved this salad. 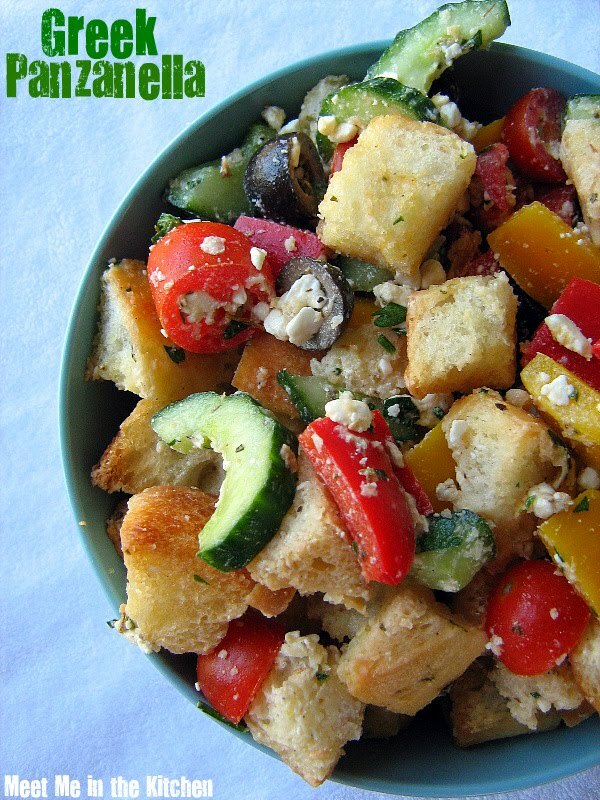 This healthy, quick salad has great crunch and lots of refreshing flavors. It’s wonderful on its own and also takes well to simply prepared proteins; grilled fish, shrimp, chicken or tofu are great. A perfect balance of hot, sour, salty and sweet, this dressing is like a flavor knockout—also a great dip for summer rolls. I haven't participated in Martha Stewart's Cupcakes Club for many months, but I wanted to make cupcakes the other day and the choice for this month seemed perfect- Snickerdoodle Cupcakes. I made 1/4 of the cupcake recipe and ended up with 6 cupcakes. I made 1/2 of the 7 minute frosting recipe and got to use some of the egg whites that have been hanging out in my freezer. I thought the meringue-like frosting was perfect for these cinnamon-y, but not too sweet cupcakes. My kids loved this combination and so did my husband. I had extra frosting, so I piped it onto a plate in little shapes ( it didn't take long for little fingers to find these little mounds). You can find these cupcakes all over the internet with lots of different frosting choices- I have seen them with cinnamon cream cheese frosting and different types of buttercream, but I think that the 7 minute frosting compliments them perfectly. Of course, if you don't like meringue or marshmallows, you would probably want to choose a different frosting option. 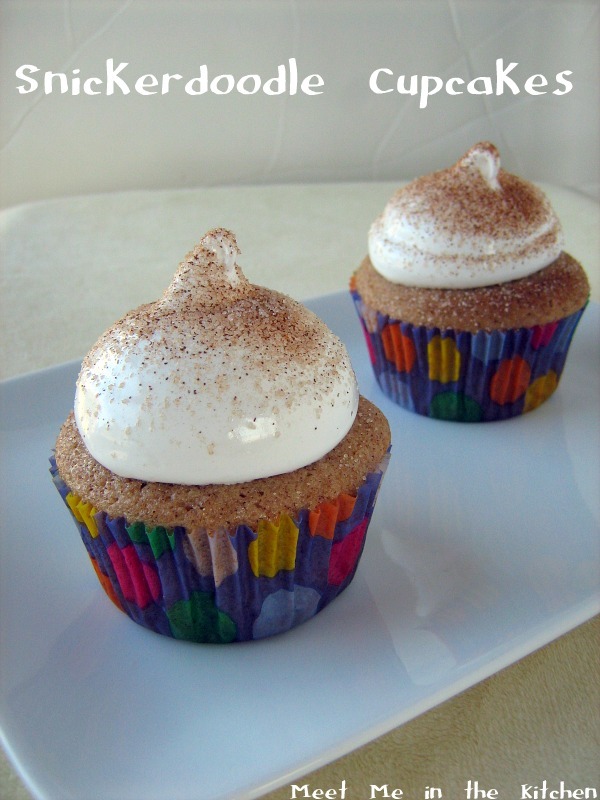 To see who else made this month's cupcake, go to MS: Cupcake's Club! 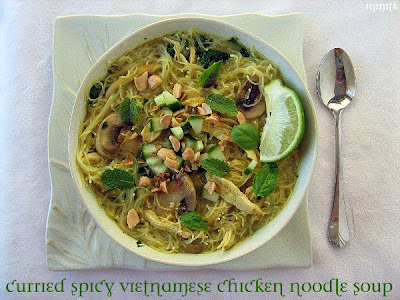 This week's selection for French Fridays with Dorie, chosen by Dorie herself, was Spicy Vietnamese Chicken Noodle Soup. One thing that I love about Dorie's cookbooks, is that she always includes different options and ideas to add a little flair to the basic recipe. This recipe had the option of making a version with curry powder. I love curry powder and I thought it would give great flavor to this soup. So, I made the curry version. I couldn't help but add some veggies- mushrooms and spinach. I used rice sticks because that is all I could find. 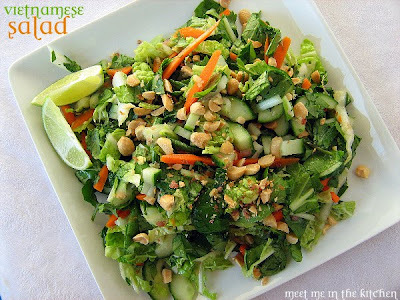 Topped with chopped cucumber, chopped peanuts, basil & mint leaves and lime wedges. I omitted the sugar. This soup was delicious. The flavors all melded together into something wonderful. The fresh mint and basil leaves were the perfect little compliment. I was really happy with the results. Dorie does it again! You should really get a copy of this book and try the soup for yourself. 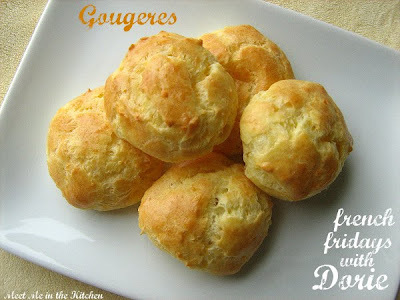 Go check out the other versions of this soup by heading over to French Fridays with Dorie! I like muffins. I don't like to eat muffins that taste like cupcakes. I prefer healthy muffins and it is fine with me if they aren't super sweet or full of fat, as long as they still taste good and aren't dry. I wanted to make pumpkin muffins and found a recipe that I tweaked quite a bit. Luckily pumpkin puree keeps baked goods nice and moist, so this recipe didn't need a lot of oil or butter. Low-fat buttermilk also added to the nice texture of these muffins. 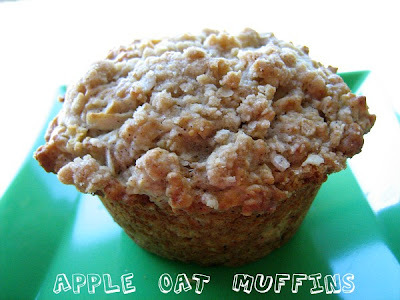 I like the texture that the oats add to this muffins as well. I made these before school one morning and added mini chocolate chips because my son thinks that mini chocolate chips make anything better. I was really happy with the results of these muffins. 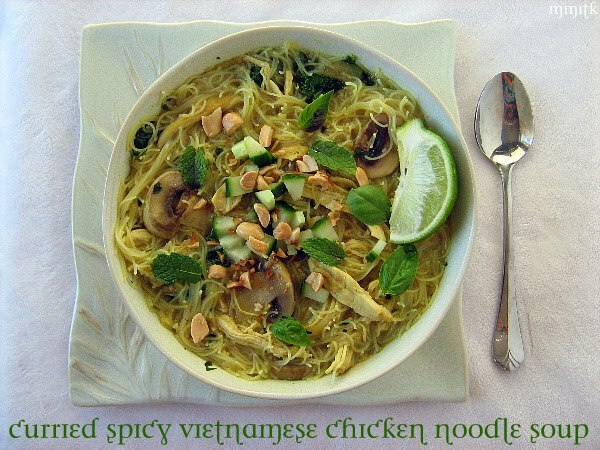 Moist, flavorful and pretty healthy! I also just wanted to share this idea I saw in a recent issue of EveryDay Food for a healthy breakfast- Savory Oatmeal with a Egg. I didn't follow the recipe, but I did use their idea (partially). 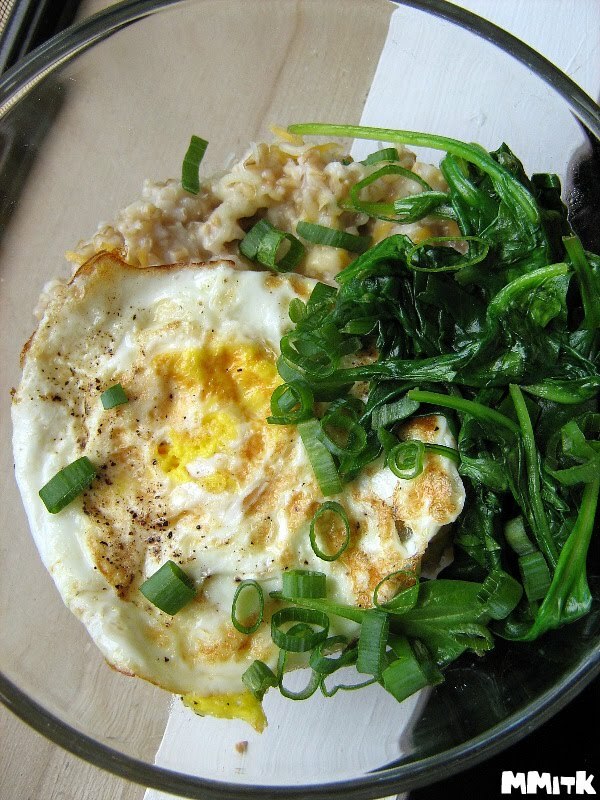 They used quick-cooking oats, a soft cooked egg, and no spinach. I made my steel cut oats on the stovetop, then fried an egg in a small amount of olive oil. Then I sauteed a couple handfuls of spinach, in the same pan. I sprinkled a little bit of shredded cheese over my oatmeal, then topped it with the egg, spinach and chopped green onions. It was really good. My 3 year old liked it too. 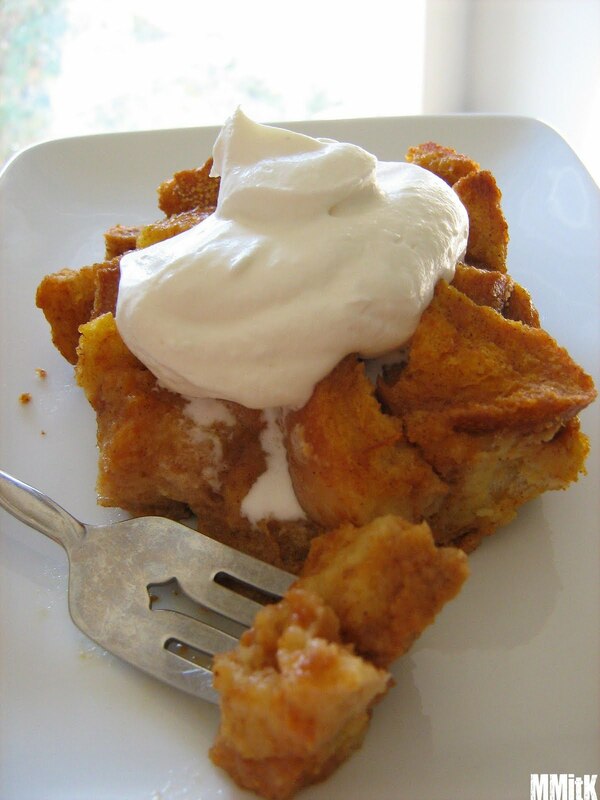 Add pumpkin, oil, egg, buttermilk, and vanilla to a medium size bowl and mix thoroughly. Add wet ingredients to dry ingredient and gently fold together, just, until combined. Stir in chocolate chips. Fill muffin cups evenly and bake for 18 to 25 minutes. Mine were done in 22 minutes. One of my favorite things about fall is canned pumpkin. 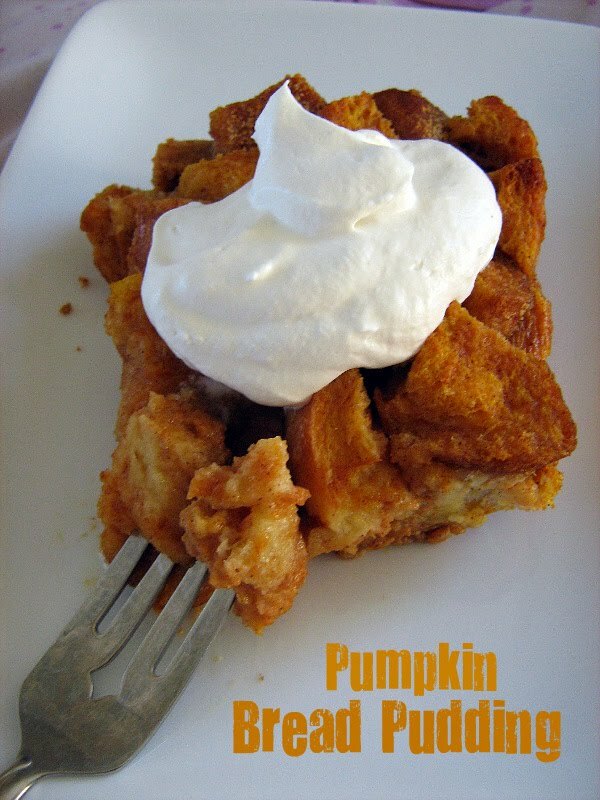 I opened a large can of pumpkin a couple weeks ago and starting making some great pumpkin recipes. 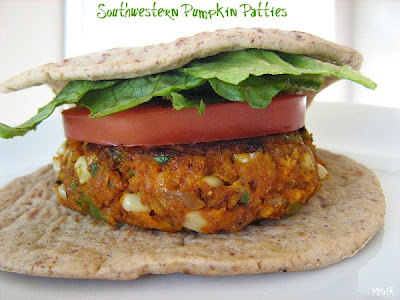 I wanted to make something savory and I found this recipe for Southwestern Pumpkin Burgers over at Eating Well. I changed the name to patties because it didn't seem right to call them burgers. I happened to have one cob of fresh corn left in the fridge, so I used that. I kinda eyeballed the amounts of onion, corn, red bell pepper, etc. and I ended up having to use more pumpkin puree than the recipe originally called for to make the patties hold together. I found these fun looking Flatout FOLDits and so we used them to hold our patties and toppings. These were pretty good. The flavor was very similar to a savory sweet potato recipe, if you are looking for some sort of comparison. This was a fun way to use pumpkin. I don't watch much tv, but for some reason one day, I happened to see The Barefoot Contessa prepare this dish. 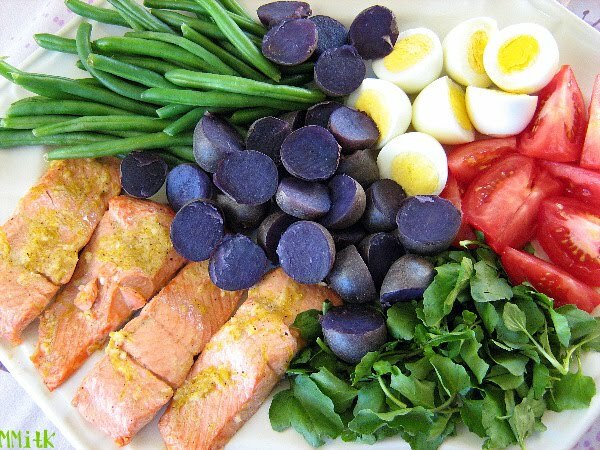 Originally, I was just going to use the recipe for the salmon since we love fish and eat it all the time, but then I saw some cool looking purple potatoes at the store and decided I would go ahead and do the whole platter. When Ina made this dish she was preparing for 12 people, so I only prepared 1/3 of the recipe. I found fresh wild sockeye salmon at the fish counter and was really excited about it. The salmon was amazing! Best salmon I have tasted. It was soo good. I reduced the oil in the marinade and the vinaigrette because I always do that when I make a vinaigrette or marinade and I don't feel that it takes away from the overall results. My kids really liked this meal. I served it on the platter and everyone was able to take what they wanted using a pair of tongs. 1 of my kids didn't appreciate the watercress because it was "spicy". This was a hit. Very delicious. Double Apple Bundt Cake. It just sounds perfect for this time of year. We finally got out of the 90's this past week and had some cool weather, so an apple cake really fit into the beginning of fall. Lynne over at Honey Muffin chose Double Apple Bundt Cake as this week's TWD pick. She will have the recipe posted on her blog. You can also find many versions of this cake all over the web. The reason this is called a Double Apple Bundt, is because it contains apples two ways. 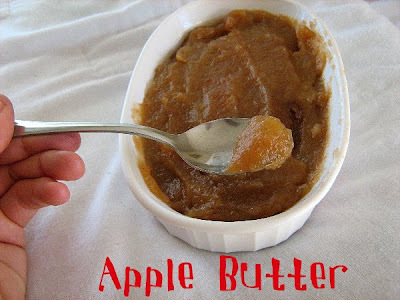 2 apples are peeled and shredded into the cake batter and 1 cup of apple butter is also used in the cake. I don't usually keep apple butter on hand, so I knew I wanted to make mine at home. I knew that way I could control the level of sweetness and spice. I made 1 1/2 times the recipe so that I could make a normal bundt and 6 minis. I knew I was going to give the big one away, but we really wanted to try this one too, so I kept the minis for us to sample. I followed Dorie's suggestion and made these the day before, then wrapped them tightly and glazed them the next day. I used granny smith apples and omitted the nuts and raisins. This was a delicious cake. Moist, with great apple flavor. Absolutely perfect pick. Check out what everyone else thought by heading over to Tuesday's with Dorie! * I did not add the total amount of sugar called for. I added 1/2 of it and tasted it, then a little bit more, so it wouldn't be too sweet. * My apple butter was ready after 3 hours in the oven. A couple of weeks ago we were having company over for dinner. I always analyze and then over analyze what I should make when people come to dinner. I never know if our way of eating will satisfy someone else's taste, so I get a little crazy about it. I think about food all the time anyway, so I really just spend too much time thinking, planning, undoing my plans, and re-planning. I finally narrowed it down to a menu that would savor the last of summer fall-ish type dinner. Since we were still enjoying 90+ degree days and all my favorite summer foods were still readily found at the farmers market, we went with the summer menu. I wanted to try this Greek twist on The Barefoot Contessa's Panzanella, because the original version is a crowd pleaser that we love. It turned out to be the perfect choice. Everyone was really happy with this dinner. Phew! 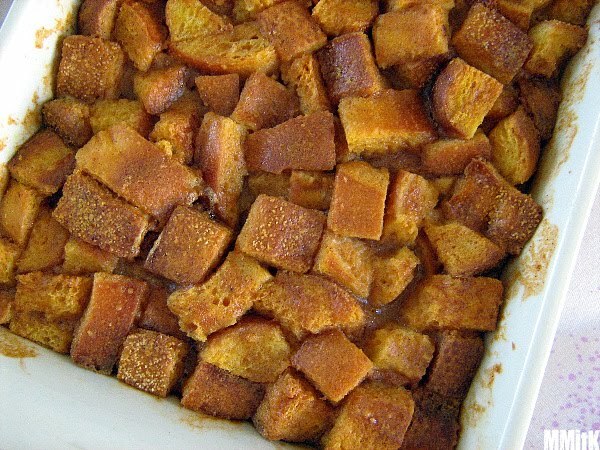 * note--I always toast my bread cubes in the oven, drizzling them with a little bit of olive oil, to get them nice and crisp and also to reduce some of the fat in this meal. I also reduce the amount of oil in the dressing.